WHITNEY Houston's daughter has been released from a Los Angeles hospital after being rushed there the morning after her mother's death. 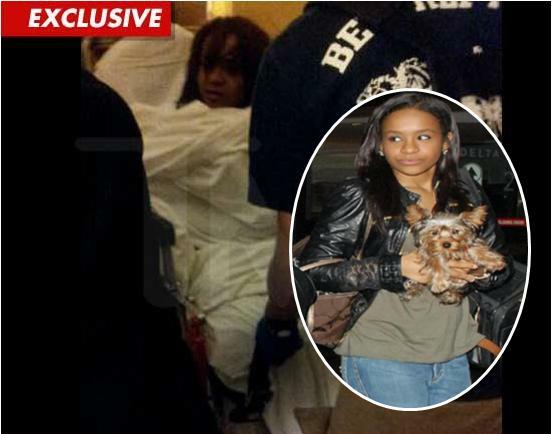 A source close to the family who did not want to speak says Bobbi Kristina Brown was treated and released for stress and anxiety. The 18-year-old was taken by ambulance to the hospital around 10.30am on Sunday from the Beverly Hilton Hotel, where her mother was found dead Saturday afternoon. Brown had accompanied her mother to several pre-Grammy events last week. Coroner's officials received Whitney Houston's body early yesterday morning, but have not yet said when an autopsy will occur. Any cause of death determination will likely be delayed while they await toxicology results. "She was taken to hospital and treated for stress," a friend told AFP, speaking on condition of anonymity after media reports that the 18-year-old was taken to the Cedars Sinai hospital in Beverly Hills. Houston, a superstar in the 1980s and 1990s with hits including I Will Always Love You, was found dead in her hotel room at the Beverly Hilton on the eve of the annual Grammys award show yesterday.